One for Judy, one for Nicky. ‘Toffee Apple’ is a collection of three much-loved songs from performer Peter Combe. Here they are illustrated with bright colours, with words in larger fonts and a variety of colours. Animals dance as they eat their toffee apples, read the daily newspaper and imagine what it would be like to have six flies land on your jelly. This sturdy paperback comes with a cd of the three songs so everyone can sing along! There is so much colour and movement in every page of ‘Toffee Apple’ that it is virtually impossible to sit still while it is read. And that’s probably the plan. Peter Combe’s songs are full of wonderful silliness designed to get children dancing about. The colourful pages and all-over-the-place text contribute to the fun. Sing along! Recommended for pre- and early-schoolers. I can’t believe it. It can’t possibly be true. Cassi Valentine – the best most excellent pop star in the WHOLE WILD WORLD – is coming here. To my town. Maybe even to MY SCHOOL!!! I heart Cassi Valentine SOOO MUCH! Ella is back in a new adventure told through her diary. In ‘Dreams’ Come True’ Ella is excited to hear that her music idol is coming to town and that if they can win a competition, Cassi might perform at their school. She has a last-minute brilliant idea and then discovers she has to work with her enemy, Peach Parker. Everything goes wrong and it begins to look like not only will winning be impossible but that Ella will have alienated all her friends. Dreams Come True is written in a handwriting font complete with larger, coloured, all-caps words. Each opening includes doodle-type illustrations in black and red. 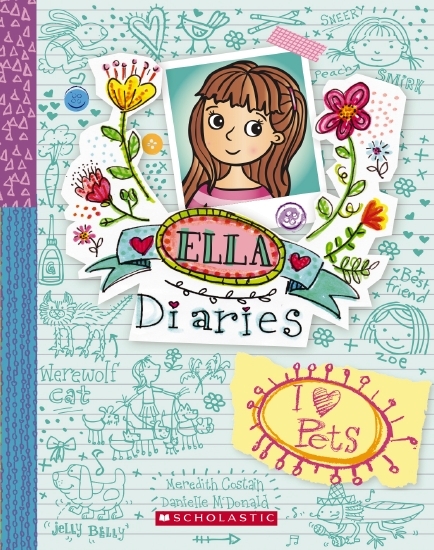 ‘Ella Diaries’ is a new series from Scholastic, an Australian pitch at the market for ‘Dork Diaries’. Ella is a passionate and energetic main character and she is surrounded by a supportive family and teachers. She is stubborn and loyal and just a tad sure she’s generally right. About most things. In Dreams Come True she is excited that maybe her favourite singer might visit, but very challenged by having to work with Peach. The action is fast-paced and although filtered through Ella’s own words, the dynamics are visible to the reader. There is an intensity of emotion that many parents and teachers will recognise and young readers will empathise with. Recommended for newly independent readers who like a mixture of text and illustration. You know how some days are better than others? Well, today was one of those days. It was an exceptionally excellent, outstanding, superb, very, very GOOD day. Ella is excited when Careers Day introduces her and her classmates to people who work with animals. She’s sure she’s found her calling in life. After all, she loves animals. She and her friend Zoe establish a pet-care business and wait for the millions to roll in. But surprisingly, it takes longer than she expects, and there are hurdles she didn’t imagine. Not least, their first job is much less active than they imagine. Written in diary format, there are images on every opening. Text is in a handwriting font, and some words are picked out in colour (green). Cover is decorated with doodles and collage. 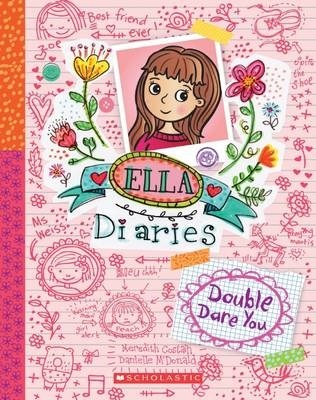 Ella Diaries is a new series from Scholastic featuring Ella, her friends, her family and her arch-rival, Peach Parker and cronies. Ella is dramatic and passionate, but her drama and passion are genuine and relatable. Each story in this series is fully rounded and believable, with realistic twists and turns. Ideal for newly-independent readers transitioning to full novels. Recommended for mid-primary readers. a) I like writing. I’m always writing stories and they love the poems I make up for their birthdays and other special days. b) They think I have a good imagination and they think writing something every day is a good way to ‘exercise’ it. c) I’m going into Grade 5 this year (starting tomorrow!) and Dad says Grade 5 was the best year of his life. Ella starts Grade 5 with high hopes, but from the beginning her first day is disastrous. It begins with the no-show of her best friend Zoe, and goes downhill as everyone else sits at the classroom tables in pairs. Only Ella is alone. And just when she thinks this is the worst thing that can happen, the door opens and in comes mean girl, Peach, who isn’t even supposed to be in this class. Of course, she sits in the only spare chair – on Ella’s table. As the days and weeks pass, Ella records her life both in and beyond school. Peach continues to cause trouble. Ella’s diary is written in a handwriting font and includes ‘hand-drawn’ images and words picked out in red. There are also crossed out spelling mistakes and phrases. Ella includes some of her poems. At the end there is room for readers to make their own diary entry, write their own poem and draw their own picture. There’s also a sneak-peek of ‘Ballet Back-flip’, the next title in the ‘Ella Diaries’ series. Cover art includes ‘doodles’ that give hints about some of the adventures within. 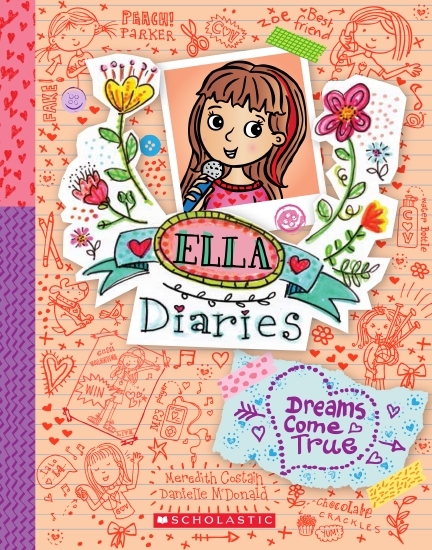 ‘Ella Diaries’ is a new series for mid-primary readers, primarily girls. Double Dare You begins with the new school year and establishes the characters and the world Ella occupies. Ella is a bright, energetic student who displays a positive outlook on most of her world (with the exception of her relationship with bully Peach). She is a leader, a supportive friend and keen to learn. Young readers will recognise characters from their own classroom, the good and the less so. When Ella has to make a decision about whether or not to do a dare, or in this case, a double-dare, she thinks about what it would be like to be the victim. Double Dare You lets the reader peek into Ella’s innermost thoughts, fears and enthusiasms. Recommended for mid-primary readers. Ella and Olivia are sisters. Ella is seven years old. Olivia is five-and-a-half years old. They live with their mum and dad and little brother Max. Ella is busy baking. She is wearing an apron and holding a wooden spoon. A packet of flour is open. Ella and Olivia are making cakes for Dad’s birthday. They want these cupcakes to be a delicious surprise for Dad when they have his birthday afternoon tea celebration. They gather all the ingredients, Olivia acting as assistant to the older Ella. Then there’s the mixing, the dividing of the mixture into patty papers, cooking, cooling then icing. Each step has the girls working together with Mum’s help as necessary. Finally it’s time to get ready, time for afternoon tea. Perfect. Best friends Ella and Zoe like the same things and often play at each other’s houses. Zoe thinks Olivia is cute, and Ella loves Zoe’s cat. And they are both very excited when their teacher announces a chocolate drive to raise money and there’s to be a reward for the student who sells the most. Ella and Zoe usually like to do everything together, but they both also want to sell the most chocolates. The competition threatens to undermine their friendship. But unexpected help arrives to set them back on track. Ella and Olivia is a new series from Scholastic for new readers. They are perfect for newly confident readers making the transition from fully-illustrated texts. The text is large and sentences and chapters short. There are black and white illustrations on each opening and a decorative border to each page. These are realistic stories with age-appropriate dilemmas. Like other early reader options, they are likely to be shared among some young girls, and collected by others. Recommended for early primary readers. Have you ever seen a chicken’s bum dance? Or an elephant’s bum lay an egg? This cute novelty offering gives youngsters the chance to explore these and plenty of other silly combinations. Pages are split horizontally so that the top half of each animal’s body can be mixed with the bottom half of others. The left side of each spread features simple text – the top half naming each animal – Frog’s bum…, Pig’s bum.. and so on – and the bottom half saying what the opposite bottom does – …swims in the pond, dances to a tune and so on – so that each animal can be matched with the text and picture of each other animal’s bottom. This is a simple yet humorous concept which will entertain prereaders and early readers, with the possibility of creating 40 combinations. The illustrations are bright and humourous. I’m Glad You’re My Dad, a new title in the ‘I’m Glad…’ series from Black Dog Books, is an interactive book designed to be completed by a child and given as a gift to Dad. Full of affirmations and ways that love is shared, there are opportunities for a child to draw and write about their relationship with their Dad. From riding Dad’s shoulders, to playing sport in the back yard, there is something for every child/father. I’m Glad You’re My Grandpa features a grey-haired bespectacled Grandpa with just a few wrinkles. As with the others in this series, it is designed to be personalised by a child and given as a gift. There are opportunities to detail the things built with Grandpa and the funny things that Grandpa does. Although some ‘Grandpa’ activities are listed, there is plenty of room to add the unique features of a particular Grandpa/grandchild relationship. I’m Glad You’re My Dad and I’m Glad You’re My Grandpa follow the format of previous titles in this series. The books are small and almost square, soft-back and strongly coloured. Illustrations are stylised and engaging. Children can express the love for their particular father/grandfather in whatever way suits them best, in colouring, drawing, writing or all three. A great keepsake, and a novel way to capture memories. Recommended for 4-7 year olds. I’m glad you’re my friend because you like to do the same things I do. I’m Glad You’re My Friend is a new ‘interactive’ title in the ‘I’m Glad You’re My…’ series from Black Dog Books. Each title focuses on a particular relationship in a child’s life and offers the opportunity to share and articulate their feelings. Each opening has an affirmation and an activity. Children can choose to write, draw, colour how they feel about their friend after reading the affirmation. They can record memories in pictures and words, and speculate about the best part of having a good friend. It might be laughing together or playing for hours without being bored, or missing them when on holidays. Each title in the ‘I’m Glad You’re My…’ series is keepsake-sized, a small square paperback. Colours on the affirmation pages are warm pastel while opposing pages range from outlines for colouring-in to lines for guiding writing. Some children may fill in every page, others may choose only to illustrate/write in a few pages, but the sentiment remains the same – the sharing of what a friend means to the writer. These books are designed to be given to the friend (mother, father, gran etc) once completed. The front cover depicts a boy and a girl as does the opening page, subsequent pages depict girl playing with girl, boy playing with boy. There are a range of play experiences from picnics to sleepovers to parties. Recommended for preschool to early-primary children.